Sanrio Characters Picross is here, giving people another opportunity to solve puzzles and see classic, cute characters as a reward. This is not the first time this has happened, but it is the first time Jupiter has been the developer behind it. 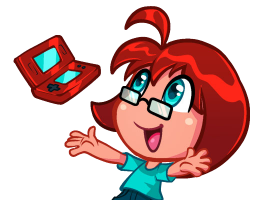 Considering this is a nonogram game from a company that is known for them, Nintendo 3DS owners should have a good idea of what to expect. But just in case this is all new information, here are some things to know about Sanrio Characters Picross. 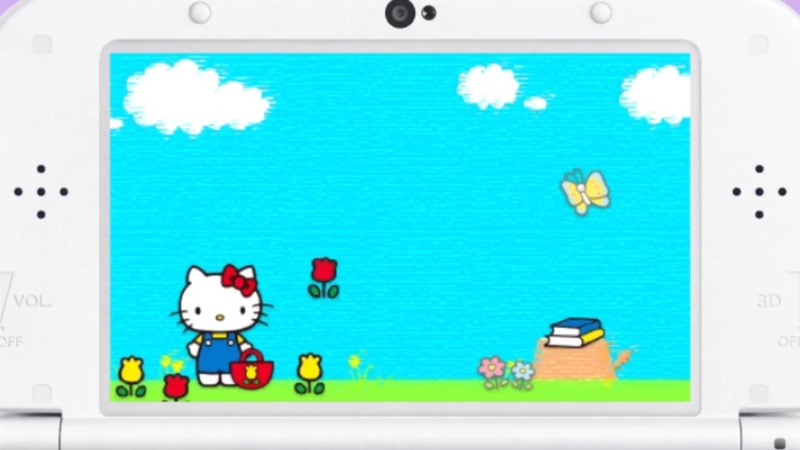 How do I get Sanrio Characters Picross? 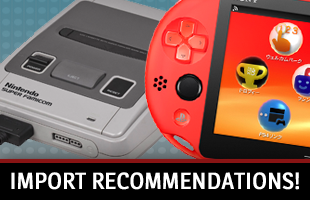 You need to have a Japanese 3DS system. This is an eShop exclusive, which means you have to either acquire money for your virtual wallet online or make a purchase with a credit card. It costs 700円, which is about $6.50. No localization has been announced. 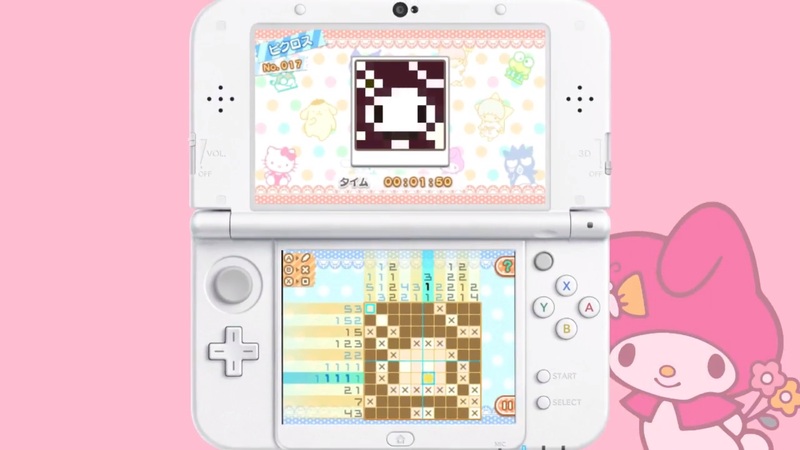 Sanrio Characters Picross is a lot like your typical Jupiter Picross title. There are 150 Picross, 150 Mega Picross and three Micross puzzles to solve. Each one has analog or touch screen control options. There is a hint roulette option, that will fill in one horizontal and one vertical line for you. You can save in the middle of a puzzle, then resume and come back to it later. 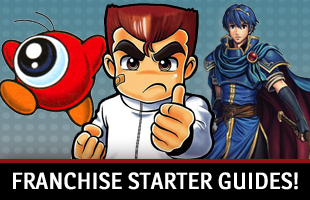 There is also a comprehensive tutorial option, helping people learn the ins and outs of the game. 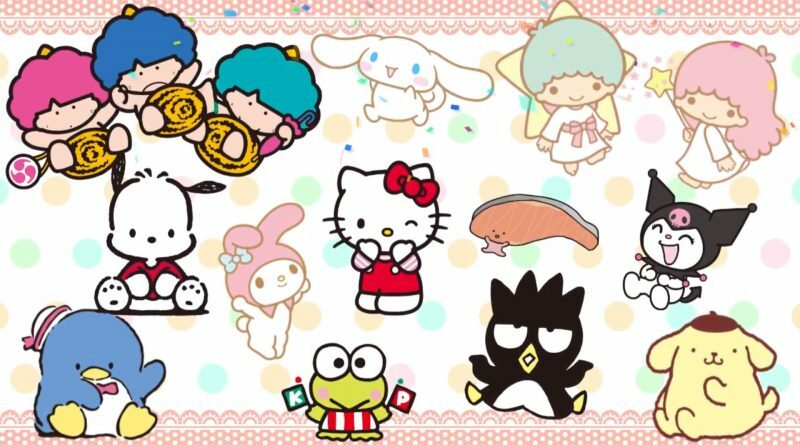 After solving a puzzle, you will get between three and four stickers you can use to create little scenes with some of Sanrio’s finest. (Each puzzle’s title suggests the character it is tied to, to offer an idea of which stickers you will get.) You will have to complete certain Picross puzzles to get the Micross tiles. What is the sticker section like? 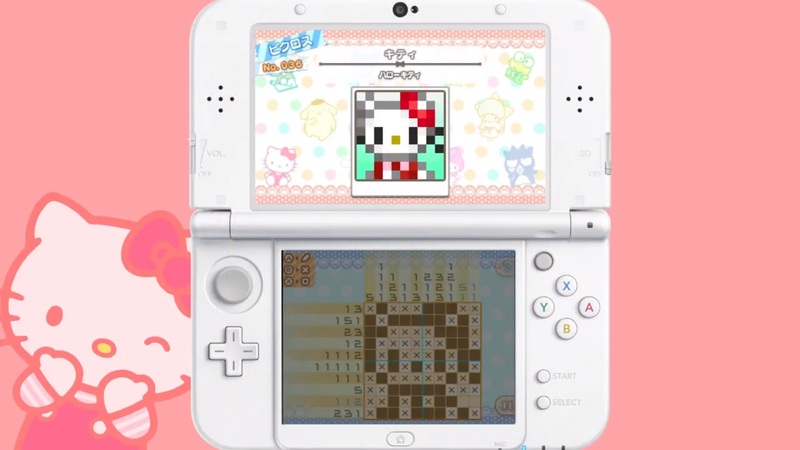 Frankly, Sanrio Characters Picross‘ customization options are rather lackluster. You have six slots for saved scenes. There are multiple characters to choose from, which appear in standard or pixelated poses. You also eventually unlock various accouterments, like bows, lace, ribbons and other accessories. Stickers are sorted into various tabs, so you would find houses and trees under backgrounds and fake food in their own area. You touch a sticker, drag it upward onto the field, then arrange it in a way that pleases you. Layering can be adjusted, to allow for the perfect positioning. Unfortunately, since we are in a post-Miiverse world, there is no way to share your creations. The only thing you can do is set a scene so it appears as the background when you are solving a puzzle or shows up behind the logo on the title screen. In each situation, selecting an image for that role puts an overlay in place that allows you to alter the picture so characters are not blocked by the logo or UI. 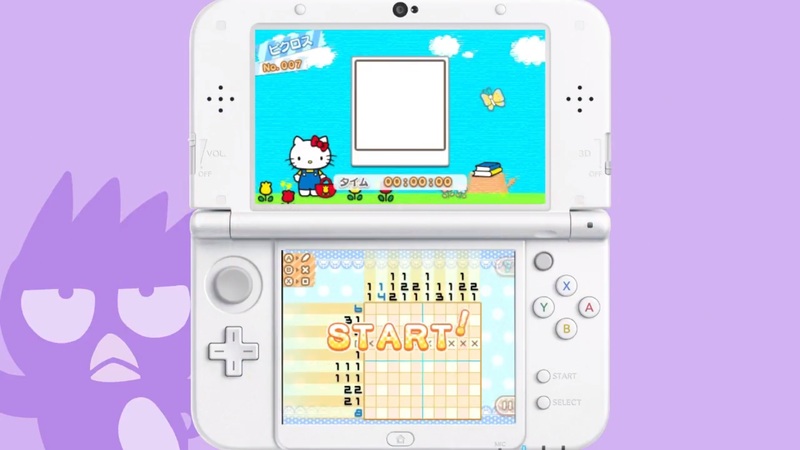 Which Sanrio Characters are in Sanrio Characters Picross? I have saved the spoilers for last! Sanrio Characters Picross is unfortunately not a comprehensive salute to Sanrio’s best and brightest. Some of the recent stars, like Aggretsuko and Gudetama, are absent. Instead, the focus is on some more classic characters. Here is who you will get to see. Granted, some of the above characters are better represented than others. Hello Kitty, My Melody, Cinnamoroll and Pompompurin have more stickers and puzzles than Goropikadon and Tuxedo Sam. Still, every once in a while you will see an underrepresented character. For example, the Lloromannic Cinnamoroll characters Berry and Cherry actually show up in one puzzle!